The first course I ever made for Pluralsight was a LINQ Fundamentals course in 2008. I’ve received many great bits of feedback about the course over the last 8 years, but I’ve also learned a few things about teaching, presenting, and making courses during that time, too. Whenever I’m forced to listen to a clip from this early course I cringe. I sound like my speech was addled by sleeping pills and vodka. 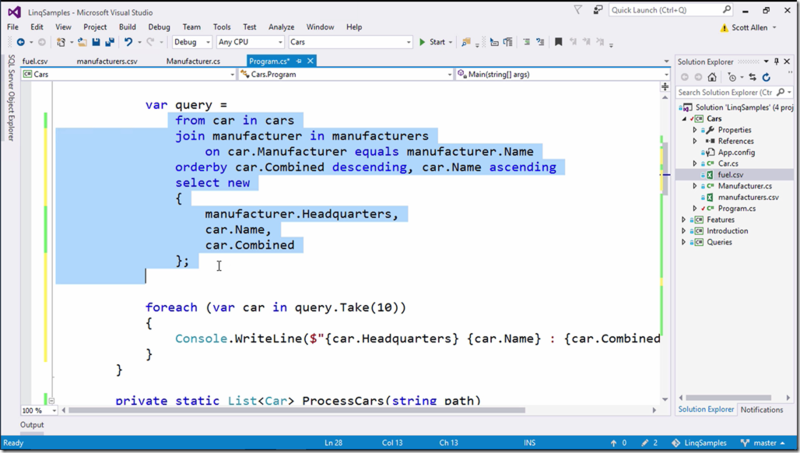 A few months ago I decided it was time to make a new LINQ Fundamentals course, and this course was released just a few weeks ago. It’s mostly the same material as the original course, but with a more logical story arc and a perky sounding instructor. I hope you enjoy watching the videos! Scott Allen... .NET... Aurelia... I'm in! Definitely enjoyed by breadth and depth of your explanation.